As the earth rotates, the zenith shifts almost half a kilometer westwards every second, if you are at the equator. Even in Tawang, this is close enough to the truth. It was also close enough to the truth to assume that dawn broke when the zenith was 90 degrees to the west of the sun and sunset was when the zenith moved 90 degrees to the east of the sun. A little correction, and that gave us 10 hours to cover the relatively small distance from Tawang to Bomdi La. The earth itself presented us with tall barriers, but we also handicapped ourselves by losing the first four hours of sunlight to the slow process of waking up and having breakfast. In terms of actual movement our progress was rapid: three and a half hours from Tawang to Se La, including breaks, another two hours to Dirang, and a final one and a half hours to Bomdi La. If we had really tried to race the earth, we could easily have reached Tezpur between dawn and sunset. But it was nice to stop now and then. At Jang I spotted an ATM and stopped to get some money. In Tawang my card had crashed one ATM, another refused to accept it, and a third had long queues. The the Avatar spotted a petrol station and insisted on topping up an already nearly full tank. This gave The Family time to do some useful birding. Then further on we stopped to look at a frozen stream. The temperature had fallen due to the snow fall near Bum La the previous night, and even at 11 in the morning the temperature was just a little above freezing. 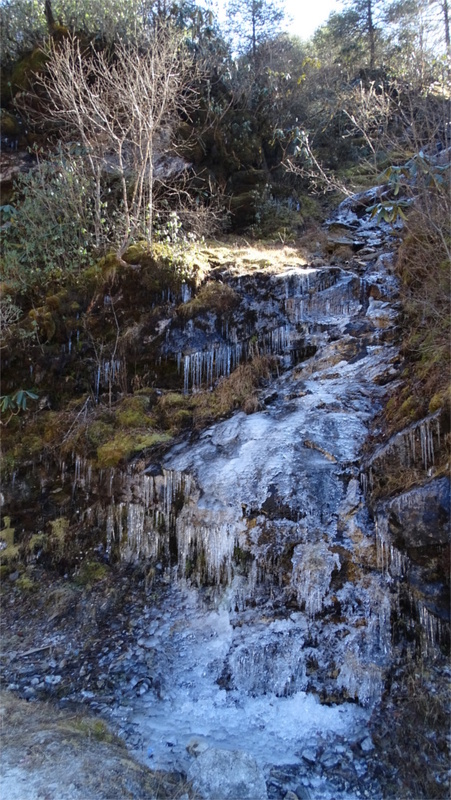 The edges of the stream had formed ranks of icicles, with ice stalagmites reaching up from below each (photo below). The stream itself looked frozen. If you looked closely, then below these plates of ice you could see the slow trickle and flow of the stream. For people like us, from the steam-bath of Mumbai, this was a fantastic sight. We stopped at a point just below Jaswantgarh for a last look at Tawang. Far below us the Tawang Chu flowed in its valley, and in the distance we could see the sloping plateau on which Tawang town rests, the monastery perching on the highest ridge on the plateau. A couple of bends in the road on, we were at Jaswantgarh. We stopped for the samosas. The free tea warmed us. Half a week ago there were as many tourists coming south as going north. Now we saw nobody on the way north; perhaps they would arrive later in the day. From Jaswantgarh it was a steep climb to Se La. A wind blew up the valley of the Nuranang river as we climbed. When we reached the tip of Paradise lake, I asked Avatar to let me off. I wanted to walk the rest of the way and meet up with the gang at the army canteen at the pass. This lake looks like an artificial lake created by damming a stream. Reading the histories of the India-China war of 1962, it seems to me that this must be part of the old effort to fortify the pass and use it as a fall-back position. This strategy had failed in 1962. One hopes that the rivalry between India and China never reaches a stage when it has to be tested again. 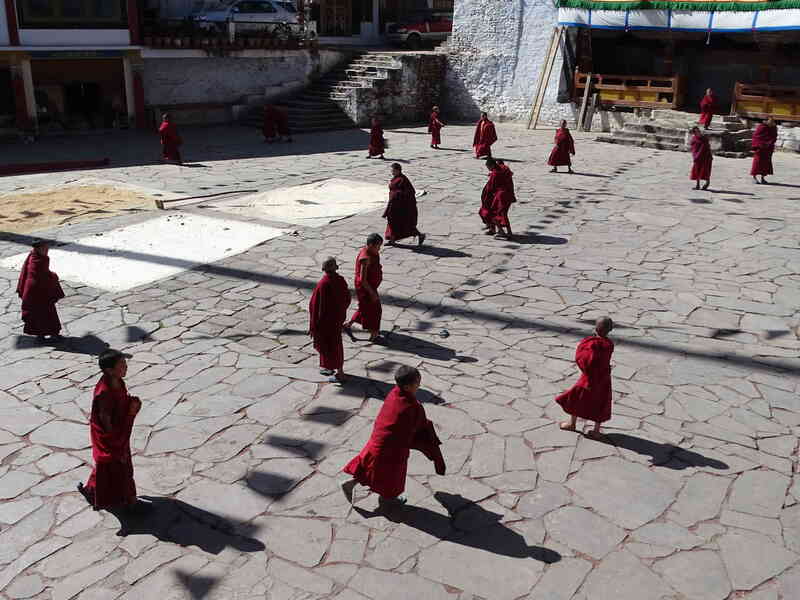 Although we had reached the edge of the Tibetan plateau in our trip, I had the feeling that I had not walked enough. Now, as a cold wind blew up from the valley behind me I had a wonderful walk. I was at a height of over 4000 meters, and the only vegetation around me was sparse grass. The sky was blue and nearly cloudless. Around me circled a mass of large black birds; crows, I thought first. But their calls were more musical. As a small part of the flock landed near me I recognized them as yellow-billed choughs. I walked on in the cold breeze, the desolate landscape, the absence of people, the call of the choughs. I wished I had had more time during this trip for such walks. My hour was soon up, as I arrived at the army canteen to meet up with The Family and the Victors. It was a little warmer on the other side of the pass, but still cold in absolute terms. Work gangs were repairing the monsoon damage to the road. The lack of technology was remarkable; and it meant that there were people working at jobs which did not need them. More than anything else, this drove home to us how poor and underdeveloped this part of the country remains, in spite of the pious hopes we read about in newspapers. 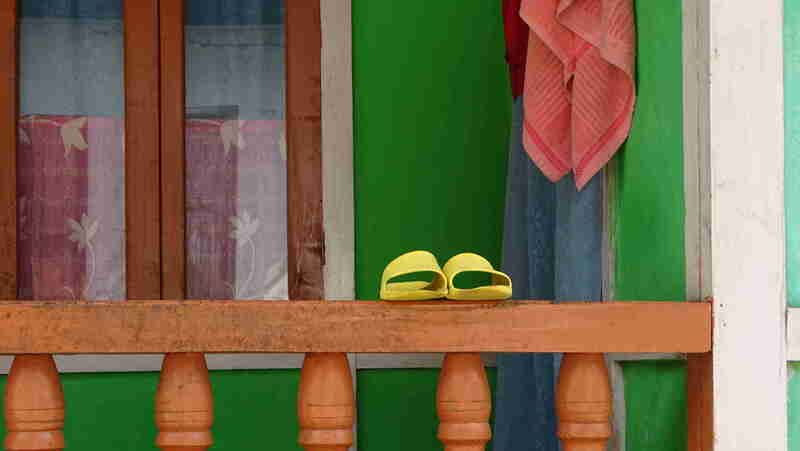 Later in the day we passed a small village, and when The Family saw a pretty young girl walking along by the road she wondered aloud what this girl could expect out of life. A little below Se La I saw this group of women from a work gang taking a little rest. It was so cold that they had covered their faces. Life in India is hard for many people, but it seems much harder up here. The pursuit of happiness is a luxury here. We reached Dirang before sunset, and stopped at the market for a samosa chat at the bazaar’s most popular spot: Sanjay Hotel. The public toilet in Dirang bazar turns out to be very clean, and a boon to travelers. We pressed on. The sun set before we reached Bomdi La. It became dark very quickly, but as we climbed it got a little lighter. I stopped to take a shot of the last colours in the sky. Trucks were passing by, headlights blazing. I managed to catch one such headlight painting the vegetation by the side of the road a lovely yellow to go with the dark hills and the fading sky. We drove into Bomdi La in time for tea. We would have an early dinner and turn in, because there was little to do after dark in this little town. The next day was a short drive down to the plains. Our holiday was almost over. 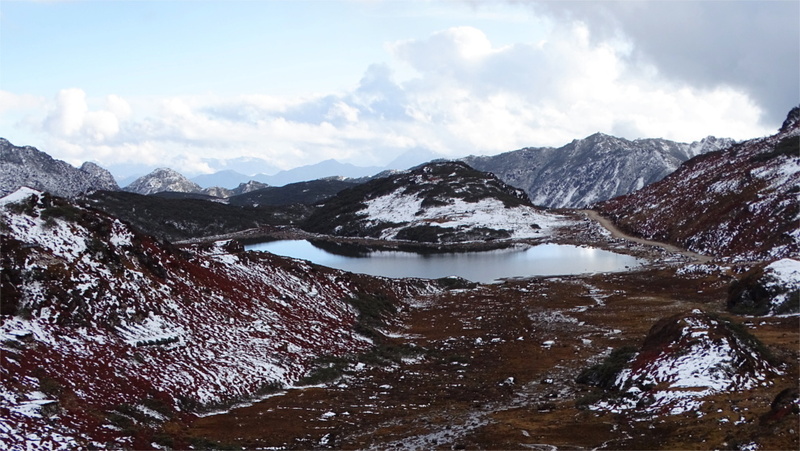 The landscape on the way to the 5072 meter high Bum La pass, on the border of India and China, is beautiful. If you reach Tawang, there is no reason not to press on to Bum La. 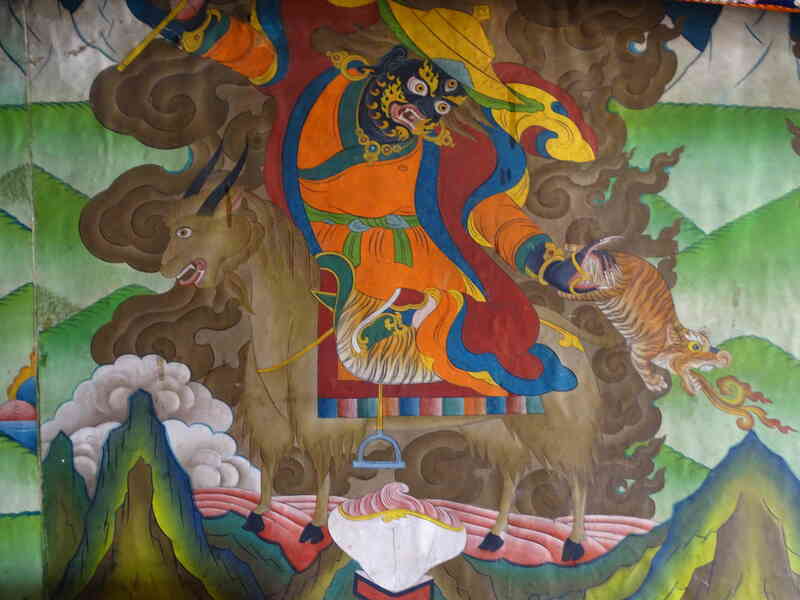 There is a lot of material on the web about travelling north of Tawang which is garbled or plain wrong. Here are the facts: you can take your own car to any of the lakes or monasteries north of Tawang, there is no need to hire a local taxi. You need a “Restricted Area Permit” (RAP) only if you want to travel to the border pass of Bum La north of the Y-junction. Your hotel can arrange for this pass. There is a canteen at the Sangetser lake where one can have lunch. In case you are interested in planning your trip, I give distances and times in a table right at the end of this post. We traveled to the border of Tibet in China on the day of Diwali. Since the army post on the border invites their counterparts in China for a lunch every year on that day (and five others) we were only permitted to travel north of the Y-junction after 2 PM. 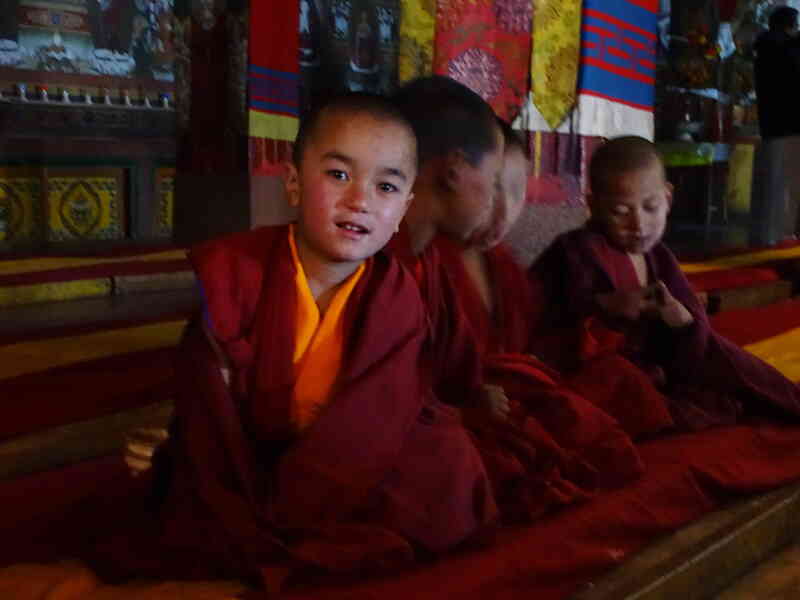 We decided to visit the Penga Teng Tso, the Sangetser Tso and the Taktsang Gompa before this. We also decided against taking our own car because Avatar Singh refused to travel on roads where he had not gone before. However, we saw many private cars on the way. 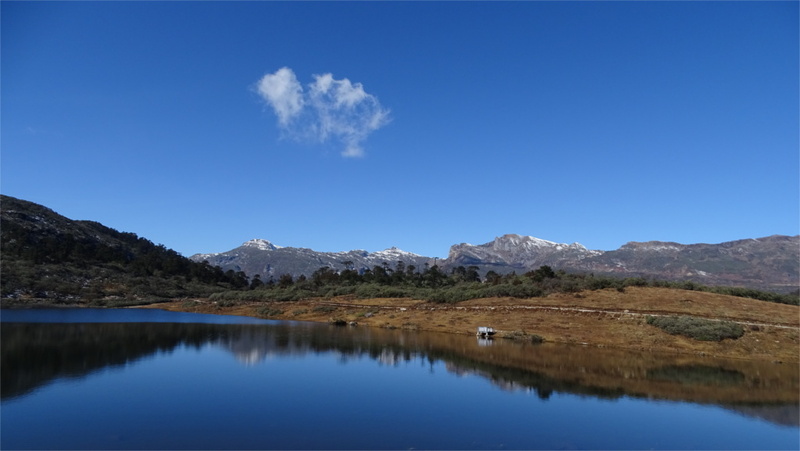 Penga Teng Tso is a beautiful lake which stands less than half an hour’s drive north of Tawang. The road up to this lake was very good. Although our driver was not keen to stop here, we had heard so much about it that we insisted that he turn off the main road here. There is a path down to the lake, and a good path right around it. I went down and touched the cold and clear water. On the far side of the lake I saw a herd of yak, and my intention was to walk around the lake to it. Behind me the driver pleaded lack of time with my companions, and they asked me to turn back. I took some photos of the lake and the herd, and came back. As we drove on the road did not remain good for long. We saw work gangs repairing the road at intervals. The whole landscape was full of lakes. We did not know the names of most of them. Although our driver was local, he did not know their names either. He claimed that since no one lived here, nothing was named. This is clearly false, since some of them were named. In any case, we could not possibly stop at all of them. I took some photos, like the one above. You can see the red bush which is ubiquitous as you climb towards 4000 meters and beyond. I haven’t found what it is called in English, Latin, Mon or Tibetan, but surely it is well known and must have been described years back. As we climbed, it became colder. There was hardly any snow on the ground. What little there was speckled only north-facing slopes. Eventually we passed Y-junction and took the fork towards the Sangetser lake, Taktsang Gompa, and the Zemithang valley beyond it. The road wound down towards Sangetser Tso, but climbed very rapidly from there towards Taktsang Gompa, about 6 kms further along the road. 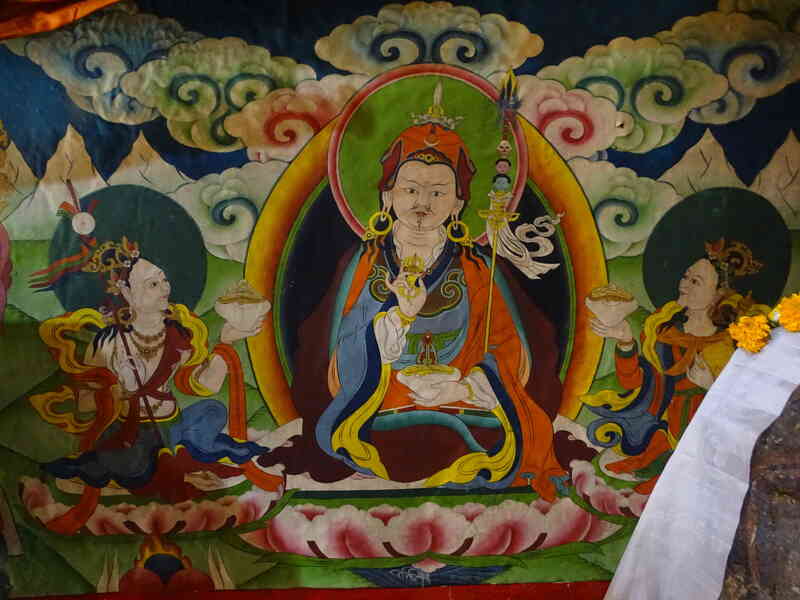 The guru Padmasambhava brought Buddhism to the Himalayas, and is credited with having founded three Gompas called Taktsang (Tiger’s Nest). 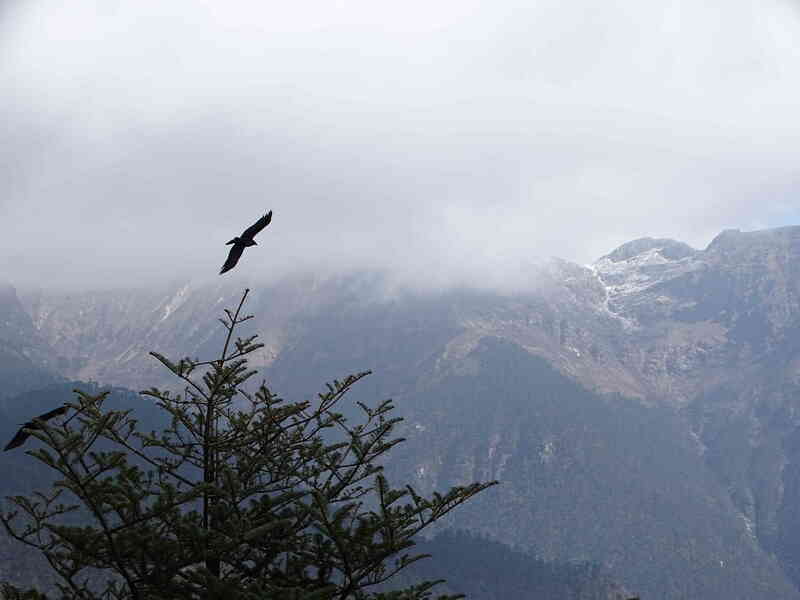 We had done the two-hour climb to the one in Bhutan perched magnificently over a cliff. We could drive right up to this, although it is also placed as precariously overlooking a valley far below. 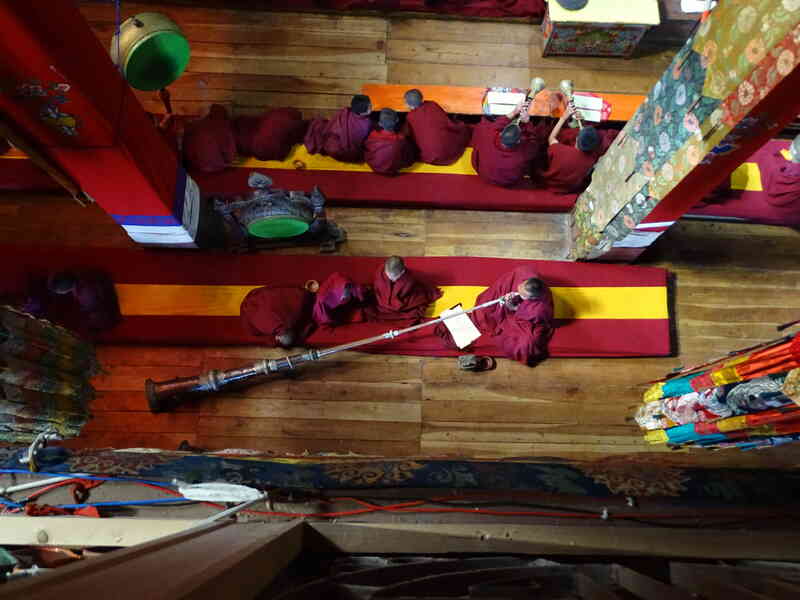 The gompa is small, but very atmospheric, and full of travellers from Zemithang. We had given up on bird watching at this height. In the cold weather almost everything would have moved down. 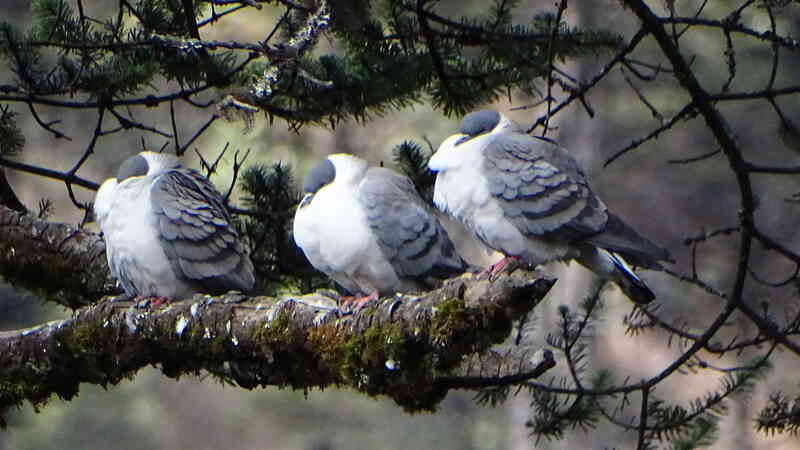 But The Family saw a flock of about forty pigeons come to land on a tree near the monastery. When we looked carefully at them we realized we’d never seen anything like them before. The fat birds were clearly cold, and tucked their heads into their shoulders as they sat on the tree. Later we managed to identify them: they are snow pigeons. Another lifer! We went back to Sangetser Tso. 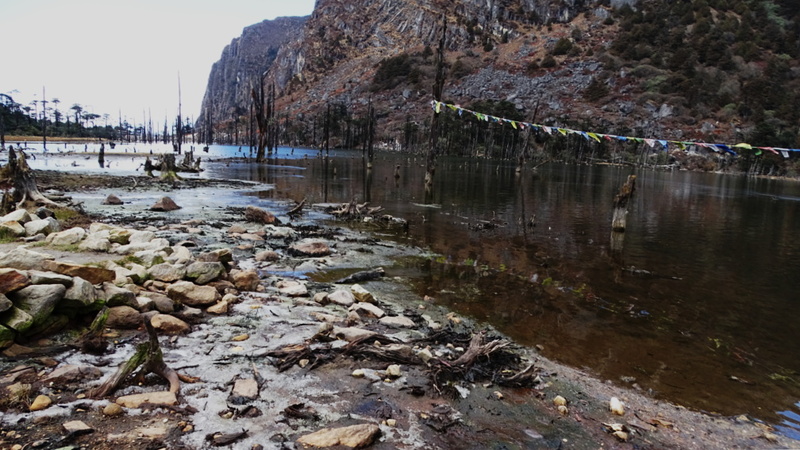 We were told that this lake formed when a recent earthquake dammed the outflow of a river. One can see that it is connected to a river. 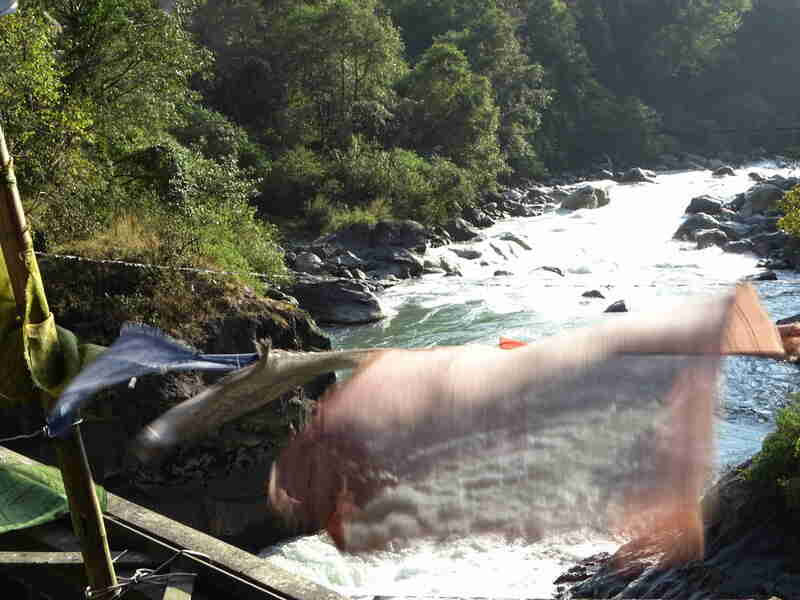 In fact this is the same river which flows through the valley above which the Taktsang gompa sits. Unfortunately I don’t have maps which name it. I wish I had asked for this information from one of the many friendly army guides we met. In any case, you can see that the lake bed was flooded fairly recently, because the disaster killed a lot of trees. The trunks of these dead trees still poke out of its blue waters, and makes it one of the most distinctive lakes in the vicinity. In fact, distinctive enough that Bollywood superstars Madhuri Dixit and Shah Rukh Khan were filmed dancing around here in a long-forgotten movie. We ate at the canteen which the army has built near the lake. The building was warm, and there was quite a variety of food available. As we ate, the driver began to get agitated and wanted us to leave immeidately. It was barely noon, and if we left now, we would have to spend almost two hours waiting at the Y-junction for the army to let us through. The driver was agitated and would have nothing to do with this logic. We realized later that he had never been to Bum La and was scared of getting stuck on the road. He was much more reasonable on the way back. In any case, we delayed a little, and had to spend only about forty five minutes at the Y-junction. The army had given the same start time to many cars. The road towards the border are bad, and the army likes to bunch up cars so that one car can help another in an emergency, or at least convey a message about a stuck car to them. The photo above gives some idea about how bad the roads are. In some places it can be told from the surrounding terrain only by the fact that the stones on the road bed are somewhat smaller than most of the stones around. The steep grades that would have to be negotiated now and then were made very difficult by this kind of surface. On the other hand, there were no dangerous sections overlooking cliffs. We had reached a high plateau, and the road was roughly flat. The land sloped up towards a height of 5000 meters, and the cold was becoming intense. Suddenly we were at the end of the road. There was a muddy parking lot for the cars. We got off and some army men told us to walk ahead towards a reception hut. We sat down there, and were offered a tea. Apparently some people have trouble breathing at this height, so the attempt to make you sit down. No one around us seemed to have an altitude problem. It was bitterly cold, however. We walked the last few meters to the border. Our army escorts requested us not to take pictures of the Indian installations, but did not care if we took photographs of the Chinese side. Some mountain dogs played a game of tag, crossing borders at will. We were shown a line which was apparently the border. There were many Indian tourists and some Indian army men at this line. Strangely there was no one from China. Their border post was apparently three Kms away. No Chinese tourists ever came to see the pass across which trade had historically joined Tibet and India. In the bitterly cold wind we photographed each other. One of my panoramas turned out to include two of our army guides. In retrospect I see that they look cold too, although they put up an act of bravado in front of us. I was so cold that as soon as I got back to our car I had to wolf down a small bar of chocolate. When we started back it was still bright daylight. Our driver was clearly under less pressure now. He was very willing to stop and look at the lakes which we passed. One of them was this beautiful heart shaped lake: a beautiful blue surrounded by slopes covered with white ice and red plants. It had turned cloudy in the previous couple of hours. Now the clouds began to lift and the sun began to shine through these breaks. 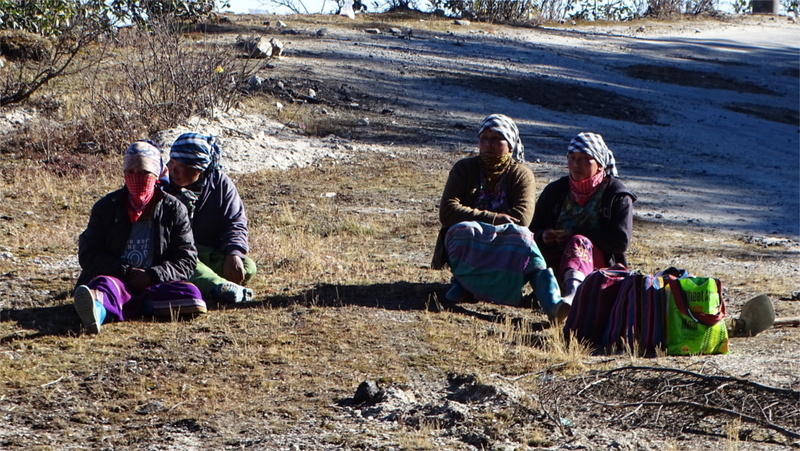 When we got back to Tawang it was 4 degrees below freezing. 1500 meters above that it must have been easily 5 degrees colder, and with a pretty big wind chill. This was one of the most exciting Diwalis that I have ever had. Distances and times are from the Tawang Circuit House. 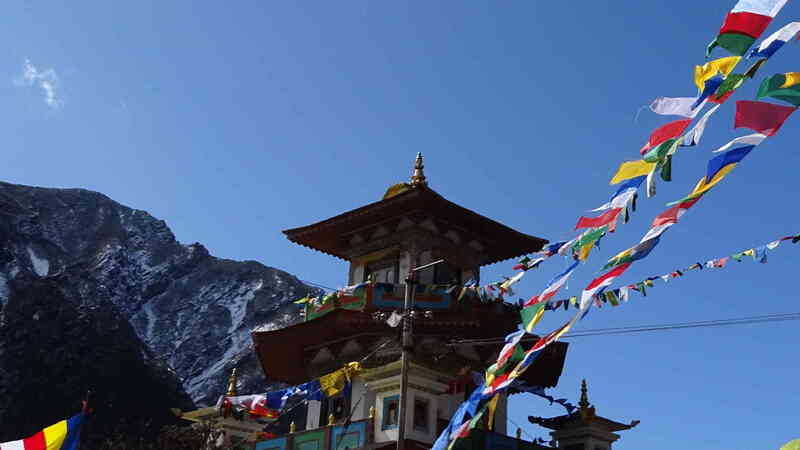 The full on-road timing for the circuit Tawang to Y junction to Sangetser Tso to Taktsang Gompa to Sangetser Tso to Y junction to Bum La to Y junction to Tawang is about 350 minutes. The morning was bright and cloudless. By now we had got used to waking with the sun. Just before we left, the sun came up over the mountain and began to light up the Dirang Chu and the bazaar next to it. Dirang is at a height of just about 1500 meters. 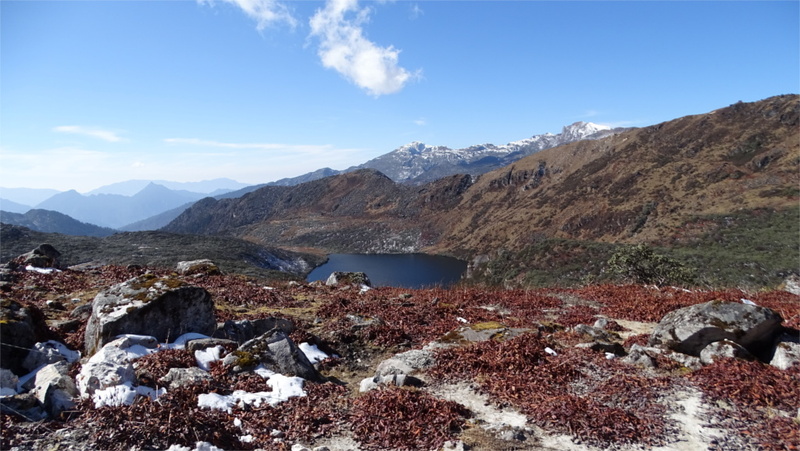 We would climb rapidly to 4100 meters at the Se La and coast gently down to Tawang, whose altitude is about 3000 meters. Se La is reputed to be cold always, so we were prepared to put on four layers of clothes each. We barely needed two on the warm and sunny morning when we started. The road climbed rapidly. The surface was quite bad in patches. As we approached the pass we saw the first ravens. We stopped the car. The deep cry of ravens carried in the air and we saw them flying above the cloud covered peaks around Se La. In a tree near us one of the jet black birds sat. It turned to look at us, and then flew off. Se La is a hidden pass; you need to come pretty close to it before you see it. The Family was in front next to Avatar, and Avatar pointed out a random peak to her and said that Se La was next to it. She was quite cut up when the road went elsewhere. Avatar had this ability to completely cut out everything except the road right in front of him. That’s why he was always afraid of getting lost. As we approached Se La the magnificent peaks around it came in view. 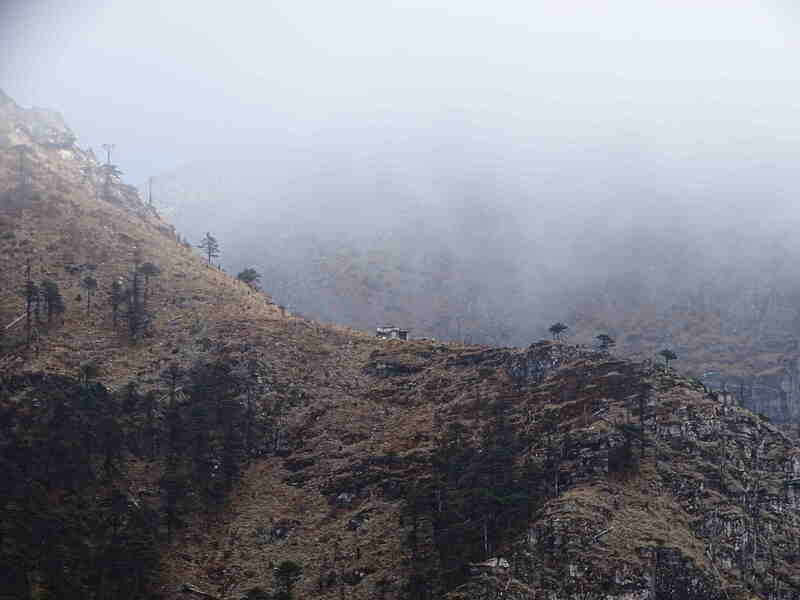 The dense fog would sometimes cover the whole range and reduce visibility to a point where everyone except Avatar noticed. Then it would lift partly to reveal a slope plunging a kilometer down. The clouds seemed to be drifting to the right. I had put on my third layer when we got out to see the ravens. Now I shrugged on a jacket. The road turned, and turned again. Suddenly we went through a gate. Avatar would have driven on, but we pleaded with him to stop. I zipped up the jacket and stepped out. Although there was little snow, there was a keen breeze. I had to fumble for my gloves. Just north of the gate is a lake, which is probably called Paradise lake. The slopes on either side can be climbed. I pulled on a covering for my head and started up the slope on my right. I wanted to do a short, controlled climb to see whether I got tired or breathless. I got to a hut at the top of the ridge and looked down at the blue lake surrounded by meadows with grass dried to a bright yellow. I was ok; happy, but a little cold. I went down and joined the others in the canteen run by the army. The cosy room, samosas, bread pakoras, and tea warmed us all up. We drove on down. The slopes were covered with a red bush which we would see all through the region north of Se La. A little less than an hour later came to Jaswantgarh. This is a memorial to a battle in the 1962 war where the Indian army held off the invading Chinese army for 72 hours. Jaswant Singh, a rifleman who captured an enemy machine gun and was killed in the process, was awarded a posthumous Mahavir Chakra for his role in this battle. Across the road from the memorial is an army canteen which serves very good samosas and free tea. 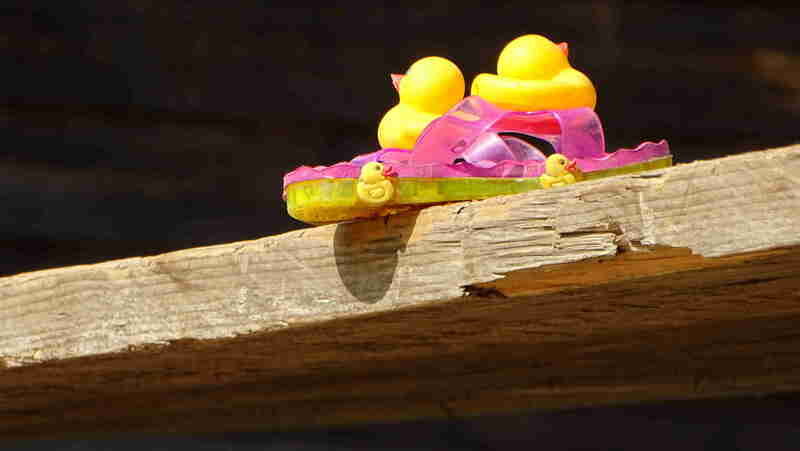 There is a little platform which juts out over the valley of the Nuranang river. The Victors took their record shot here. We met a couple who were on the way back from Tawang. Talking to them we learned that the road to Bum La is open and not as long as some sources claim. The downhill road got worse as we proceeded: bumpy and dusty. We passed the strung out town of Jang a little past one in the afternoon. Immediately after this town we saw a sign pointing to a side road which would lead to a view of the Nuranang waterfall. Avatar took this road only after registering a formal protest about the possibility of getting lost. Nuranang turns out to be a high waterfall, at least a 100 meters. The afternoon sun set up a lovely rainbow in the spray. 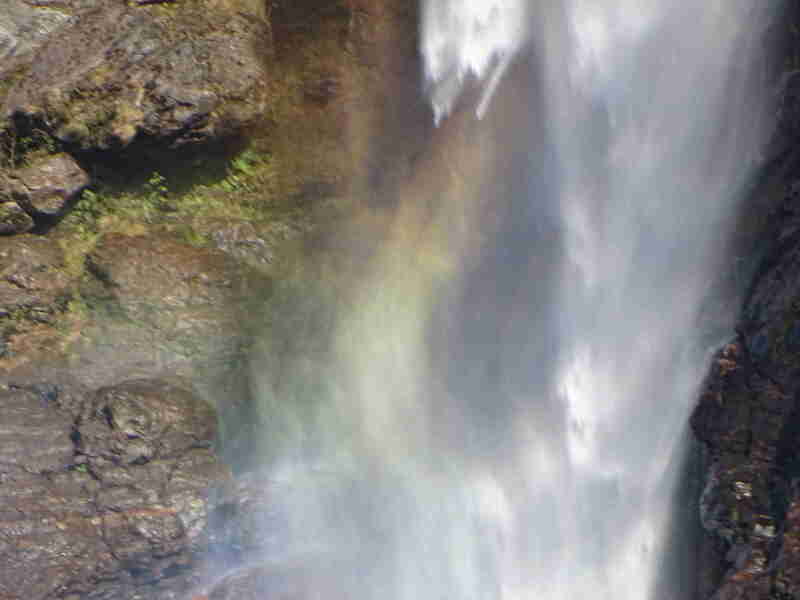 Nuranang waterfall is sometimes called the Jang waterfall after the nearby town. This is the spot where the Nuranang river falls into the Tawang river. In the photo above, you can see Tawang Chu flowing down the valley. A hydroelectric station is just visible in the lower right corner. 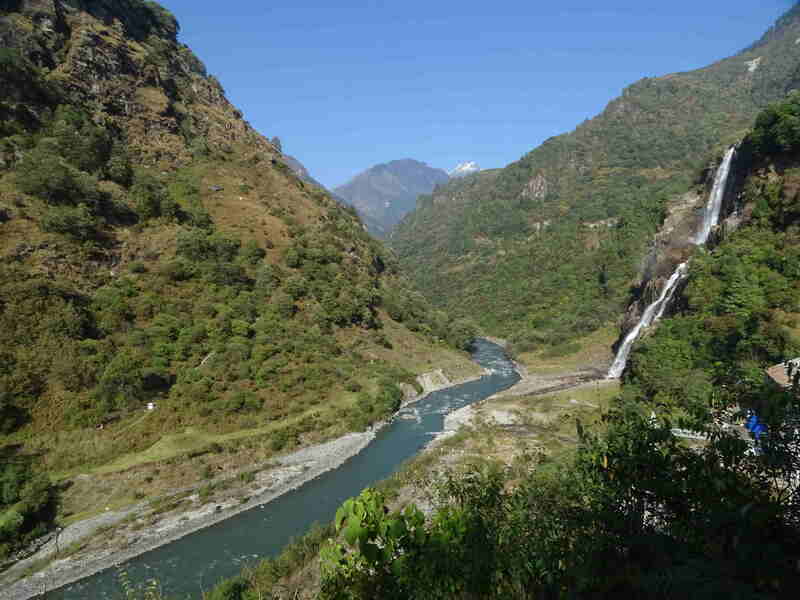 We found our way back to the highway easily, and proceeded down to the Tawang river. At a bend in the road we found a small roadside restaurant where we stopped for lunch. I had a mild headache which got worse as we came down. Since it was past two in the afternoon, I figured this was due to hunger. We ordered two thalis: a vegetarian thali for The Victors, and a chicken thali for the two of us. Either the food was very good or we were more starved than we had realized. The thali came with unlimited amounts of rice, dal and two vegetables, so we were surprised that two people were allowed to share one. Avatar also looked pretty satisfied with his meal. We hit the road again, and crossed the Tawang river pretty soon. 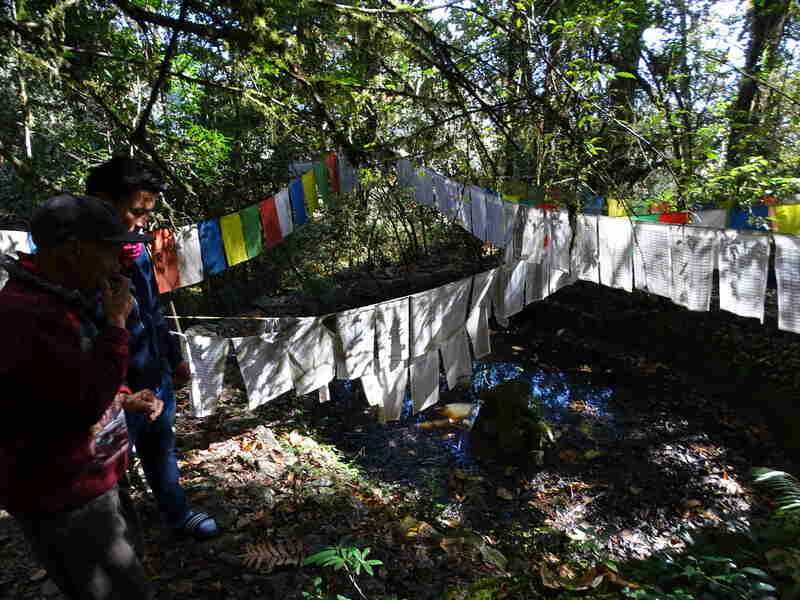 The bridge was just wide enough for a single truck, and was festooned with prayer flags. The river gushed over rocks at this point. It would take a pretty skilled white-water rafter to do this stretch. Avatar was happy to indulge us in our desire to get back on the bridge to take photos. We had to dodge trucks pretty sharply as we did that. Strange how the highway looked quite empty as we drove, but now three trucks passed in rapid succession. This was a strategic bridge during the 1962 war. When the Chinese army occupied everything north of this bridge, the Indian army demolished this, and prepared Se La for defense. The destruction of this bridge halted the Chinese advance for three weeks. We didn’t know it yet, but we were pretty close to Tawang now. The road surface improved. In about an hour we had reached Tawang. The sun would set only after we were settled in our hotel rooms. It had taken us about 8 hours to cover around 130 Kms. We’d covered the distance from Guwahati to Tawang in three days and two nghts, if you subtract the two days we had spent in Nameri and Dirang. My headache got worse and I began to get the sniffles. I took a gram of vitamin C, a doze of zinc, and settled in front of the room heater. The Family and Mrs. Victor decided to go off to the nearby bazar. I was going to stay warm and enjoy my access to the wifi. My attempt to make a blog post was disastrously unsuccessful; the bandwidth was just not enough to upload photos. It didn’t help that the power kept shutting off. Every time this happened, someone would switch on a diesel generator manually. The connectivity would come back only after the town power supply was restored. I’d shut down the laptop by the time The Family was back. We had dinner and went to sleep. The temperature outside had fallen below freezing, and I was keen on a long sleep to recover. One of the little headaches that afflict you when you plan to travel to the north-eastern states of India is the question of inner line permits. Do you need it? Where do you get it? Why do they have it anyway? The answer as of today is that you need it if you want to travel to Arunachal Pradesh, Nagaland and Mizoram. The Victor found a web site for the ILP to Arunachal Pradesh. We tried to get one through the web site. It seemed easy; we uploaded the documents needed, and got an instant response by SMS. Two weeks later we received a mail saying that the application was rejected. It turns out that the web-based form works only if you are planning to travel to Itanagar, the capital of the state. For any other destination, you need to apply in Kolkata or Delhi. So we couriered our application to Kolkata about three weeks ago. There has been no response to it yet. In the meanwhile we found from the car hire agency that you can apply for an ILP when you reach the inter-state border crossing at Bhalukpong. You get it within half an hour if you are a tourist. We plan to try that. Lucky we don’t want to go to Tawang to work! To get to Bum La you need another permit, this one issued by the Indian Army. Over the last decade there has been commerce between India and China through this 5 km high pass! 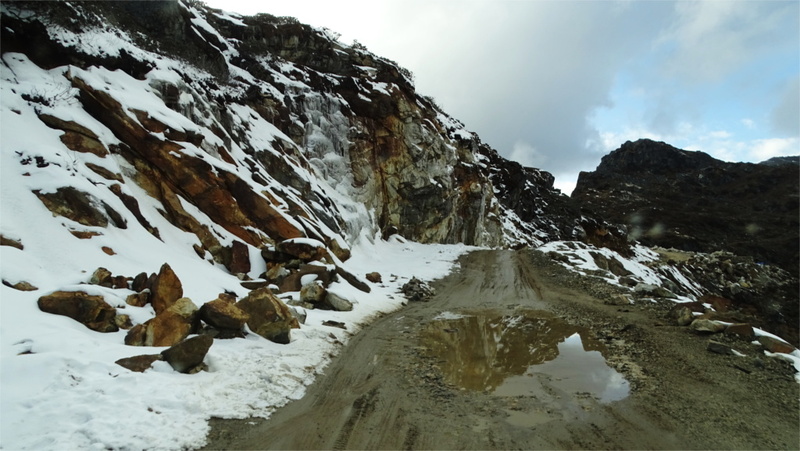 Tripadvisor forum discussions tell us that it is not too difficult to get the permit once you get to Tawang. With the recent decades of mounting tension along some borders, and terrorism across others, one understands why the Indian army may want to control traffic close to borders. But what is the logic of the ILP? A newspaper article claims that this was instituted by the British when they moved into these areas to exploit natural resources. Selectively issuing passes kept Indian businessmen out of the competition. Now the ILP is used by local tribal politicians for exactly the same purpose. However, the lack of competition and an open market has slowed the development of these states tremendously. These claims and implications by the newspaper have a certain logic. I wonder what the local people feel. I’m sure we will find out. Some things are simpler than they appear. The Inner Line Permit to enter Arunachal Pradesh was available at the Guwahati Airport. As we were about to exit, we saw a kiosk of Arunachal Tourism, with a notice saying that the ILP could be obtained there. Each of us had carried two passport sized photos and two copies of our PAN cards. We parted with these and were given our permits in a short time. Later we found that we could also have got it at Bhalukpong. The pass to Bum La was even easier. 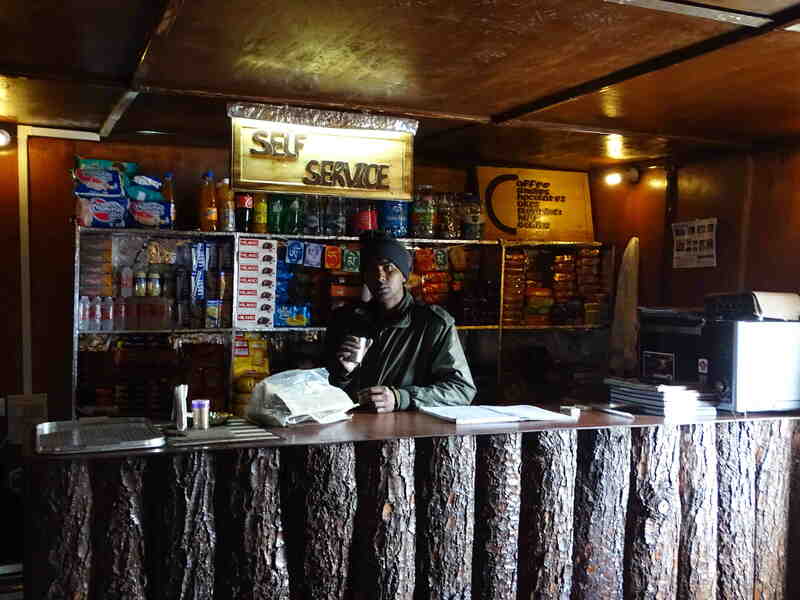 We asked the hotel in Tawang, and they arranged it for a small fee. We did not need more photos or copies of the PAN cards. The hotel took our ILP and arranged everything. Apparently, this Restricted Area Permit (RAP) is issued by a magistrate. Then it has to be taken to an army office which gives you a date and time when you are allowed to go. On Thursday we leave for our annual pilgrimage to the Himalayas. This year’s trip is to a region full of the history of a half-century old conflict. We trace the lower end of the route which the Dalai Lama took to escape to India in 1959. Then, in 1962, the Republic of India had its biggest military defeat when the Chinese army came down this route, and then withdrew. Four of us will fly to Guwahati, in Assam, and try to drive to the Chinese border crossing in the Bum La. On the way we cross the Brahmaputra river, drive past Tezpur, cross to Arunachal Pradesh at Bhalukpong, drive along the river which changes its name from the Jia Bhorloi to Kameng as we cross a state boundary, have lunch in Bomdila, touch Dirang, cross the high Se La, and rest for a while in Tawang. I was looking at distances and elevations today. Our plan involves driving about 200 kilometers to Nameri wildlife sanctuary in a day. This involves a net climb of 10 meters. After a couple of days, we drive another 160 kilometers to Dirang. This little town is at an elevation of 1497 meters. That’s not much, but on the way we cross Bomdi La, which is at 2217 meters. We spend a couple of nights in Dirang. The rare Black-necked cranes winter here, and we hope we are lucky enough to see them. 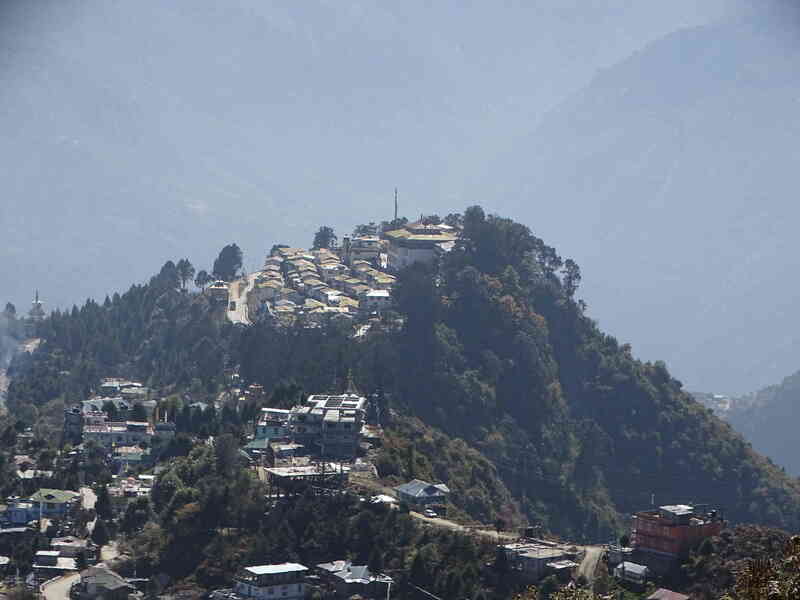 On Monday morning we do a 30 kilometer drive to Tawang, over the Se La, which is at a height of 4114 meters. I hear that the pass already has snow, but we plan to get off the car and walk to the nearby lake. This will test our altitude readiness. 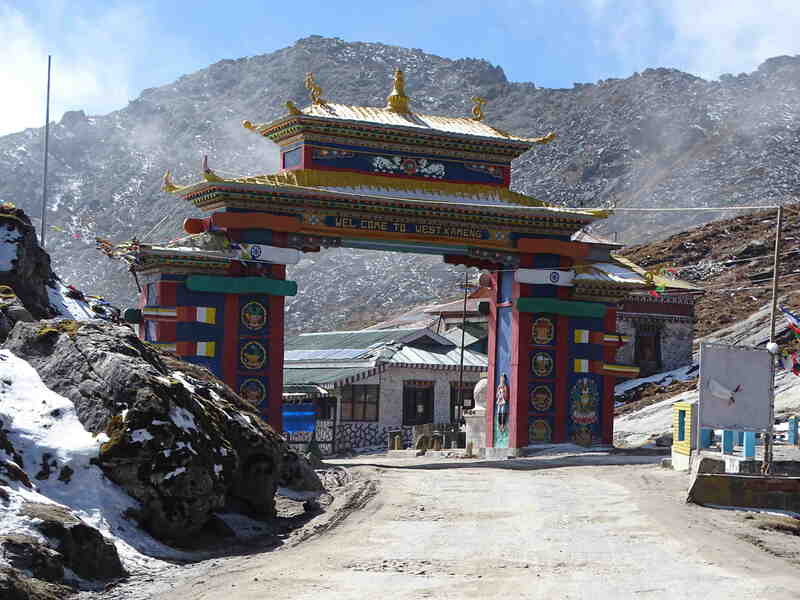 Tawang is at a height of 3048 meters, and should not present a problem. 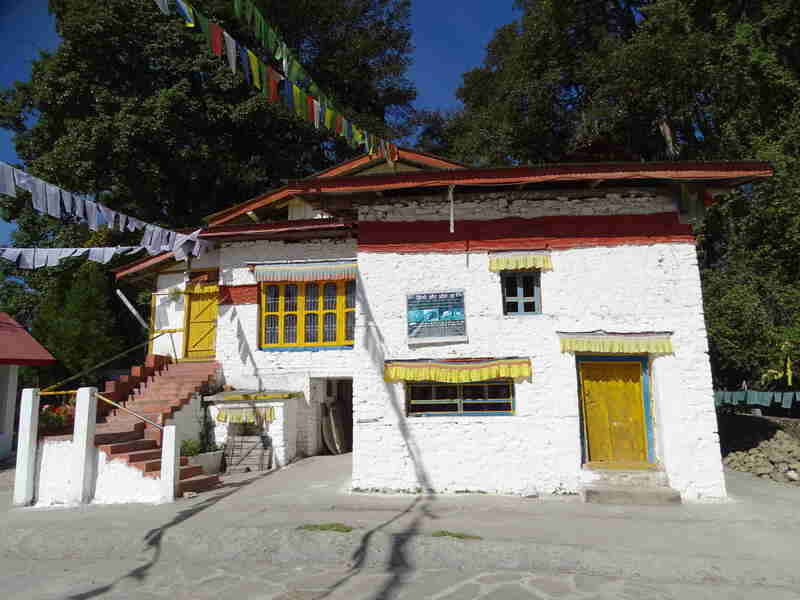 In any case, we plan to spend at least a night and half a day in Tawang before moving out. Our main objective, Bum La, is apparently fairly snow bound. The last 65 kilometers’ drive will take us to a height of 5029 meters. I want to take it slow, so that I enjoy the pakoras and tea which one can get there. The last time I went above an altitude of 5 kilometers, I was unable to enjoy the view. This time we are taking frequent breaks, and giving ourselves time to rest and walk. I hope the snow does not prevent us from reaching Bum La, and I hope this time I can walk around without getting sick. Author I. J. KhanewalaPosted on November 2, 2015 February 14, 2017 Categories India, Planning, TravelTags Arunachal Pradesh, Assam, Bhalukpong, Bomdila, Bum La, Dirang, Jia Bhoroloi, Kameng, Nameri, Se La, TawangLeave a comment on 5 kilometers up? 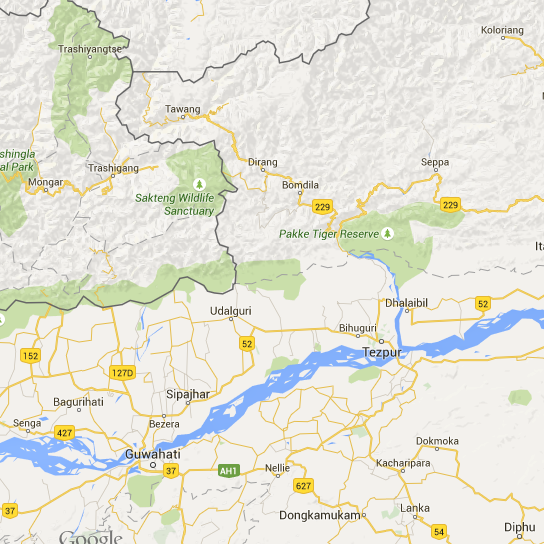 The distance between Guwahati and Tawang is supposed to be about 570 Km. Not much, you would think, but we are informed that even in good weather it would take us at least 14 to 15 hours to do this trip. Clearly, this is not something that we should try to do in one day in November. We need to break this journey up, so that we do interesting things on the way, and still have enough time at Tawang. My friend, The Victor, is great at planning road trips. He figured that Nameri National Park, which is almost halfway, 220 Km from Guwahati, should be a 5 hour drive. We reach Guwahati at around 11; so we should be in Nameri at five in the afternoon, allowing an hour’s stop for lunch on the way. Since sunset is just after 6 in this region in November, we might get in an hour of birdwatching in Nameri on our first evening, provided we do not dawdle over lunch. If we are a little delayed, then we might do our birdwatching on the way, and reach Nameri after sundown. We plan to spend two nights in Nameri, so we should get one morning and one evening of birdwatching for certain. Then we leave for Dirang, where we plan to spend the night. This is a 165 Km stretch which begins to climb, and should take us 5 hours to do. Since a check for permits is involved as we leave Assam and cross to Arunachal Pradesh in Bhalukpong, there might be queues which eat up time. Still, it would be safe to give ourselves 6 hours of driving. It should be enough to leave by 10 in the morning, which means we might be able to get in another quick morning of birdwatching in Nameri. There may not be spectacular things to see in Dirang. It is supposed to be good for birdwatching, probably also in November. 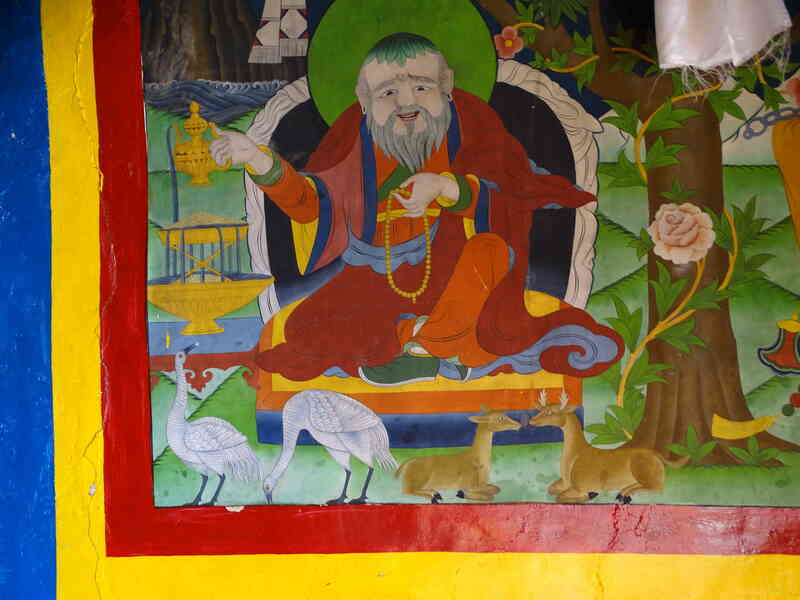 Although a dzong (monastic fort) is mentioned, the descriptions do not sound great. 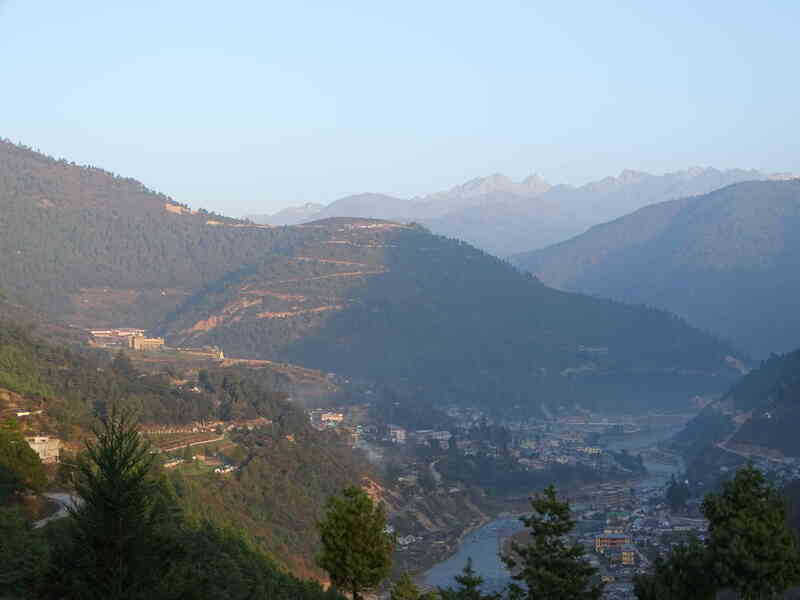 There is a mention of a gompa (temple) and great views on the way to the dzong, Since this is very close to Dirang village, we might do it in the morning before we leave for Tawang. The road distance is about 200 Kms, although the straight line distance is about a fourth of this. The road is full of switchbacks, so we should expect to take around 6 hours if the weather is good. This is reputedly the most unpredictable part of the journey. We plan to spend three nights in Tawang. 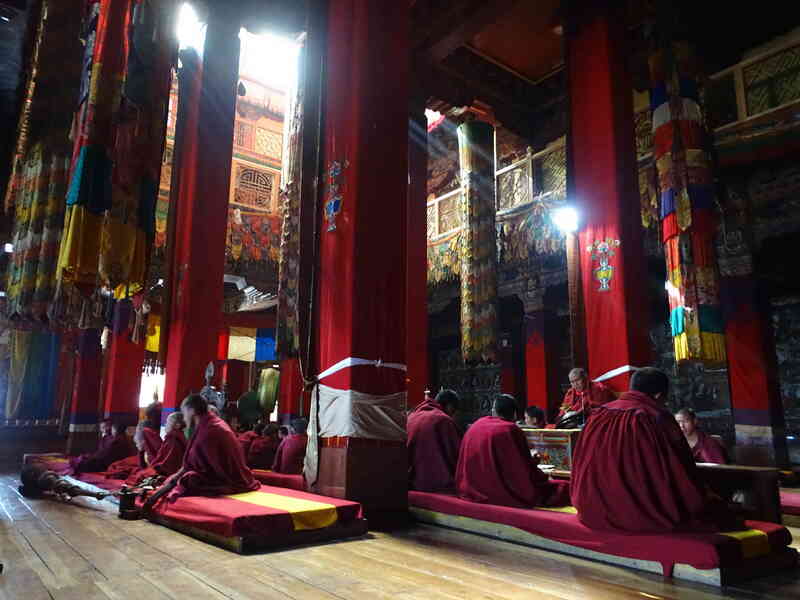 Half a day will go to see the monastery, which is the largest Gelugpa monastery after the Potala palace in Lhasa. I wonder how much it has changed since the Dalai Lama was welcomed here in 1959 when he finally left Tibet. We’ll take a day’s trip to Bum La and the Shangetser Tso (lake). I’ve read about a Takhtsang Gompa in this region, if this is anything like the Dzong which goes by the same name in Bhutan, then we must try to find it. We could try to find the Nuranang waterfall on the way, although it seems to lie a little away from the main road. I’ve seen some lovely photos of the Pangateng Tso, so that is another place we could try to visit. But really, the place The Family and I would like to go to is the Eagle’s Nest wildlife sanctuary. 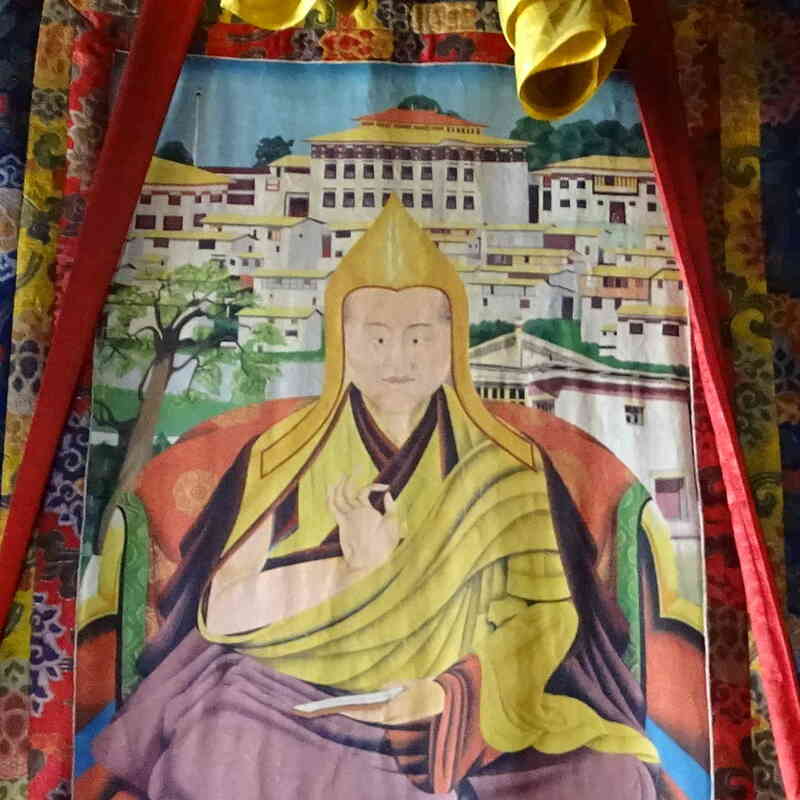 Our three nights in Tawang may not give us time to do everything in this list. 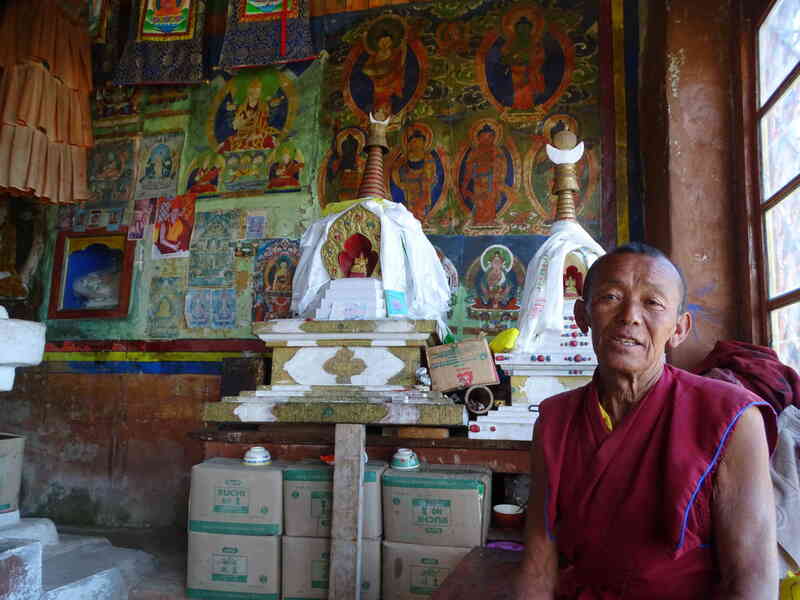 We’ve heard much of Monpa food, especially the thuppa and the fish. We should be able to find this kind of food once we start climbing. We return by the same route. 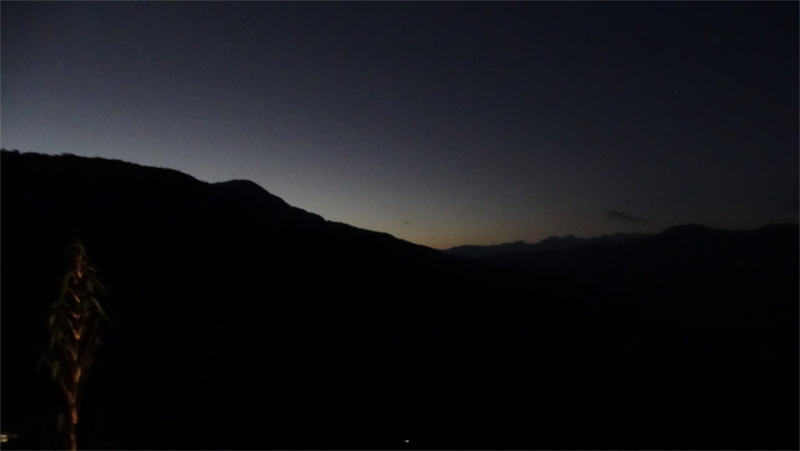 The first day we plan to spend seven to eight hours on the road and halt at night in Bomdi La. The Sessa Orchid Sanctuary near Bomdila is supposed to be wonderful; in November we may not see too many orchids, but we might spot a red panda or two. Bomdila is the gateway to the rest of India, as the Indian public learnt when this town fell to the Chinese in November 1962. From Bomdila the drive to the Brahmaputra is short. Unlike the Chinese army, which pulled back from this town after declaring an unilateral cease-fire, we will press on southwards. 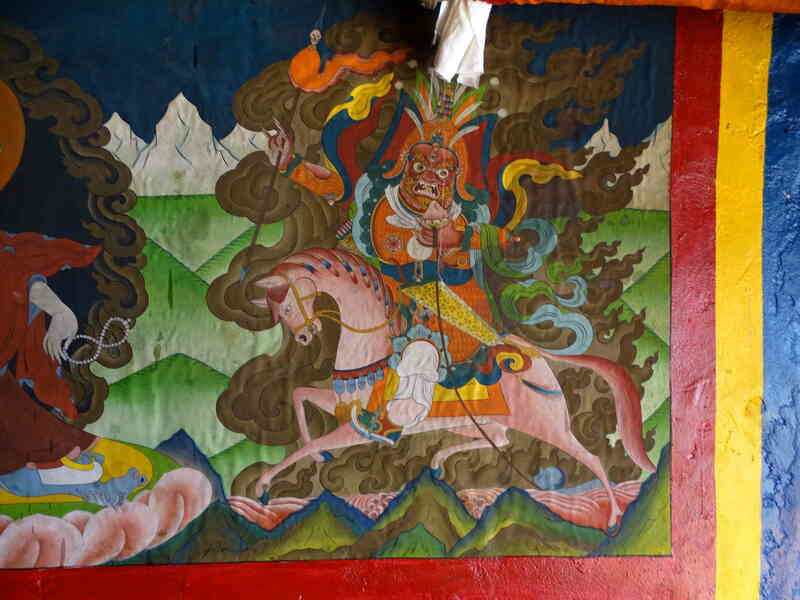 We’ll probably take a look at the Bomdila monastery before we start on the drive back. We’re planning to stay in a small tea estate for a night before getting back to Guwahati to catch our flight. The great unknown in all of these plans is the state of the road. We don’t drive very hard on most of the days. In spite of that, mountain roads are unpredictable. There’s only so much planning that you can do. Once you are on the road, things tend to change. That’s part of the fun. Author I. J. KhanewalaPosted on August 31, 2015 September 1, 2015 Categories India, Planning, TravelTags Arunachal Pradesh, Assam, Bhalukpong, Bomdila, Dirang, Guwahati, Nameri, Tawang1 Comment on So much to do, so little time!